The Golden State Warriors advanced to the Western Conference finals with a 125-121 victory over the Portland Trail Blazers in Game 5. OAKLAND, Calif. (KGO) -- Stephen Curry raised his left arm in triumph and cradled the game ball in his right as yellow confetti fell. The Splash Brothers are taking defending champion Golden State back to the Western Conference finals for a second straight year. Klay Thompson's sweet shooting touch carried the Warriors while Curry was down, and together again in the starting lineup they guided Golden State another step closer to a repeat title with a 125-121 win over the Portland Trail Blazers in Game 5 on Wednesday night. Thompson scored 33 points with six 3-pointers, while Curry added 29 and sealed it with a 3 with 24.9 seconds left. He finished with five 3s a day after becoming the first unanimous MVP in NBA history, also adding 11 assists after returning to the starting lineup for the first time all series because of a knee injury. "West finals two years in a row, it's been a special, special season," Thompson said. Draymond Green, who had his left ankle re-taped in the fourth quarter, had 13 points, 11 rebounds and six assists after guaranteeing Golden State would advance from this game. Damian Lillard scored 28 points and CJ McCollum had 27 for the Trail Blazers. The Warriors got past Portland playing without Curry for the first three games as he recovered from a sprained right knee. "We know what it takes to win in the playoffs," Thompson said. "That might be the closest five-game series of all-time." 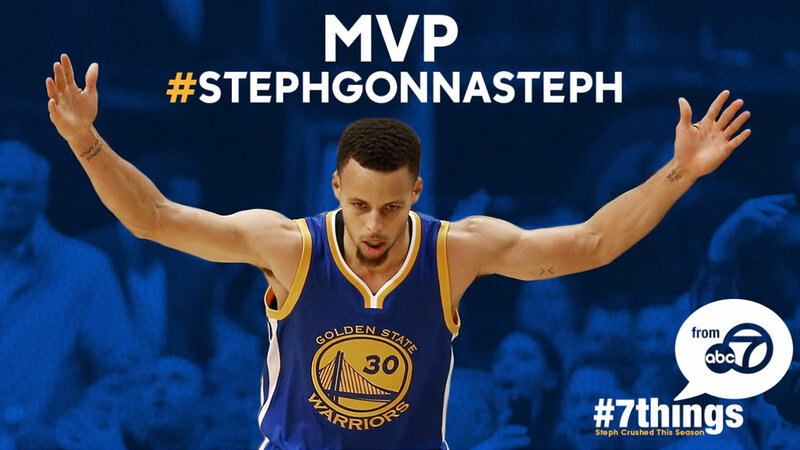 In honor of Stephen Curry becoming the first unanimous winner of the NBA MVP award, here are 7 reasons why #StephGonnaSteph. Now, Golden State will wait for the conclusion of the Oklahoma City-San Antonio series, led 3-2 by the Thunder. And the banged-up Warriors could use the time to get healthy. They lost 7-foot center Andrew Bogut for the second half because of a right leg injury. Thompson shot 13 for 17 and became the first player to have at least five 3s in seven straight games, also recording his fourth 30-point game this postseason. "Klay's shooting was incredible tonight," Warriors coach Steve Kerr said. "Then the way Steph finished the game, that step-back shot to put it to a five-point lead was probably a shot only he can make. So I thought a gutty effort from a lot of guys. It wasn't our best stuff, but we got it done." Curry's 3-pointer to beat the third-quarter buzzer gave Golden State a 93-91 lead heading into the final 12 minutes, then the Warriors made sure their raucous crowd at Oracle Arena got to celebrate another series-clincher after they eliminated Houston at home - also winning that best-of-seven series 4-1. The Trail Blazers were 16 of 36 on 3-pointers. Allen Crabbe, who played at the University of California in nearby Berkeley, scored 20 points. Green, who blocked a career-high seven shots in Game 4 on Monday, made good on his declaration to eliminate Portland. After Game 4, he said: "Do I think they're done? Of course I think they're done," which he later acknowledged wasn't meant as disrespect but rather to fuel his own team. Curry started for the first time since Game 4 of the first round at Houston, the day he slipped on a wet spot and sprained his knee. He came off the bench in a 132-125 overtime win in Game 4 and scored an NBA-record 17 points in the extra period on the way to 40. The Warriors lost the day after Curry was named MVP last year, falling 97-90 at home to Memphis as Curry went 7 for 19, including 3 of 11 on 3s, for 19 points. This time, his first points came at the 5:29 mark of the first quarter and then he got Golden State right back in it on one wild sequence. He missed a long 3 off the front rim, Leandro Barbosa got the rebound and tried a backward pass to Curry that the point guard had to save. The ball went to Bogut, who turned toward the baseline and handed off to Curry from close range and buried a 3 over his tall teammate with 4:34 to go. Lillard, an Oakland native, was 7-for-24 shooting in his final game of the season back home in the East Bay. "We should be proud of the way we pushed them," Lillard said. "It could easily have been a seven-game series."